Tropical paradise El Nido, Palawan, located in Bacuit Bay, which is about 420 kilometers south of Manila, is widely acclaimed for its white sandy beaches, coral reefs, limestone cliffs, great resorts, and a wide-range of water activities all beach-lovers will surely crave for! It is thus well-renowned as the Best Beach and Island Destination in the Philippines! #1 - El Nido Resorts – Pangulasian Island (Bacuit Bay): (pictured above) You just know it – there are going to be brighter days ahead over at Pangulasian Island, which is also dubbed, “The Island of the Sun”, what with awe-inspiring views of both the sunrise and sunset. Not to mention you will appreciate all day long, strolling on its 750-meter stretch of white sand, or swimming, snorkeling, as well as diving in its crystal clear blue-green water that surrounds this entire piece of heaven! To top it off, you can enjoy the luxurious comfort of their rooms, amenities, dining experience, and service par excellence! #2 - Las Cabanas Beach Resort (El Nido Beach, El Nido): will give you the best view of the sunset and other islands over at their al fresco bar and restaurant! Taste and see for yourselves their affordable and yummy Filipino dishes, nice accommodation, super friendly staff who will assist you in booking tours, shallow ocean water suitable for children who love to swim; ever – ready tricycles present there to take you anywhere you want, etc. #3 - El Nido Mahogany Beach Resort (Corong Corong): will leave you breathless in awe and wonder with their oh-so-spacious and rejuvenating rooms that face no less than the beach! Their cottages with wood and bamboo finishing will bring you your well-deserved comfort that is just a stone’s throw away from their infinity pool which is such a refreshing treat amidst a lush greenery of mostly coconut trees. As if this is not enough, El Nido Mahogany Beach Resort also has outstanding villas perfect for couples, families or a group of friends – featuring a private dipping pool, terrace, al fresco shower room, a garden, king size bed, air conditioning, hot water, etc. 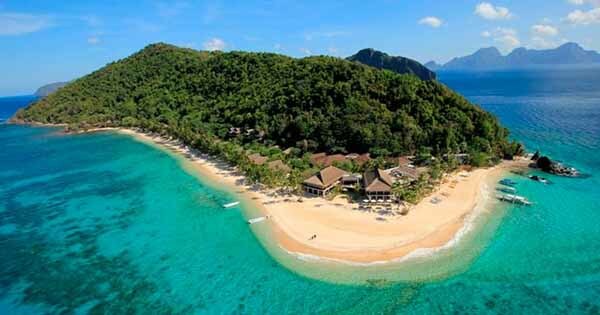 #4 - Qi Palawan (North-eastern Palawan): is another one of your dream lands which is just a wish away! So don’t you delay, then come and see the splendor of Qi Palawan, besides, ooze with joy with their unspoiled beach, tropical forest, many water activities that include scuba diving, island hopping, snorkeling et al; native-inspired comfortable cottages, villas and even wheel-chair accessible rooms for persons with disabilities. Inclusive of their room rates is breakfast plus arrival and departure transport from El Nido town. #5 - Duli Beach Resort (Barangay Bucana): It’s high time to raise the roof for Duli Beach Resort! – Find rest for your weary muscles due to too much hard work by leaving all your vacation needs in the hands of this awesome resort – we are talking about crystal clear blue water, white sandy beach, a lot of palm trees, excellent accommodation, delicious food, refreshing drinks, relaxing lounge chairs, hammocks and sun beds – on top of superb activities such as diving, surfing and island hopping! So, what are you waiting for? Aim for a fun as well as adventuresome weekend now in El Nido, Palawan!